Greg Valentine, 68, died peacefully on May 6, 2017, at Maine General Hospital, surrounded by his wife, Nelda Alariao Valentine, and his son, David Valentine. Born May 18, 1948, Greg grew up in the loving home of his parents, Ruth and Richard Valentine, in Beverly Hills, California. He was a graduate of UCLA (1970) and the law school of Loyola University of Los Angeles (1974). He was a member of the state bars of California (admitted 1974) and Vermont (1981). He spent his career as counsel for VA medical centers in Los Angeles, California, and White River Junction, Vermont. Greg loved to travel, perhaps because he spent his childhood summers traveling the West Coast in a 1950s trailer with his parents and his siblings, Eric and Christine. He passed his love of travel on to his own children, taking his family on summer trips to explore the United States in a red pop-top VW camper. Later in life, he traveled halfway across the world in pursuit of Nelda, whom he called his “pearl of great price.” After a whirlwind romance, on July 1, 2005, they were married in the Philippines, where Greg developed a fondness for sushi, sashimi, and Philippine mangoes. They settled in Maine, where he enjoyed exploring the Maine coast and its lighthouses and eating lobster rolls. Greg’s friends and family considered him to be a Renaissance man. 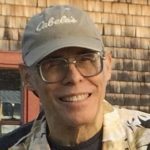 He was an intelligent and insightful lawyer, an artisan woodworker, a painter, a sculptor, a blacksmith, a voracious reader, a computer guru, and a skilled percussionist who played in the UCLA Marching Band.He opened a small art gallery in Norwich, Vermont, to showcase local artists and joined the town marching band. He was adventurous and enjoyed trying new things. He encouraged his family and artist friends to be unafraid and to explore their passions and hone their talents to excellence through hard work. His children believed there was nothing he couldn’t do. The kindness was evident in his eyes until the last moment of his life. Greg is survived by his wife Nelda; his brother, Eric; his sister, Christine; his four children, Jennifer Campi, Autumn Steinberg, David Valentine, Wendy Woodford; their spouses, Jim, Gideon, Christine, and Bill; his three nephews; his ten grandchildren; and his wife’s daughters, Sharon Rose and Pamela Gay, and grandchildren. He will be missed by those he has left behind, but has been joyfully reunited through his faith in Jesus Christ with his son Daniel Valentine, his parents, and his grandparents.